After the passing of his wife 'Hope' and his daughter, Sharon Rose, his young son, Billy Paul is all that was left of William Branham's young family. Billy Paul was only twenty-two months old when his mother passed away. He doesn't remember her; But for the next four years after his mother's death, his father would be both mother and father to him. During the years prior to Hope's death, especially after the birth of Billy Paul and Sharon Rose, Sister Hope was aided in her housework and care of the children by a young neighbor girl named Meda Broy. After Hope died, it was only natural for this young girl, then eighteen years old, to continue to care for Billy Paul. It was a comfort to Brother Branham, who had suffered such a terrible loss, to know that young Billy was in the capable and loving care of this trusted, mutual friend. Of course, human nature being what it is, the inevitable 'talk' started, involving the young preacher and this girl in a romantic link. Though innocent at the start, the talk soon degenerated into vicious gossip. Finally, Brother Branham took her aside and said, "Meda, you're a fine girl, but I don't think I could ever marry again because I loved Hope so much. Why don't you find you a boyfriend. Let us not see eah other. You deserve a good husband. Young Meda, now twenty-two, was terribly distraught over the gossip, and saddened that people had misrepresent the relationship which existed between her and the young preacher. Turning to the Lord for help, she asked God for a verse of Scripture to comfort her. As she opened the Bible, the pages opened to Malachi 4:5, "Behold, I will send you the prophet Elijah..." This was the 'comfort' God had given the young woman. But God also had words of comfort for the young preacher. The words were direct and specific: "You go get that Meda Broy and you marry her on October 23rd." 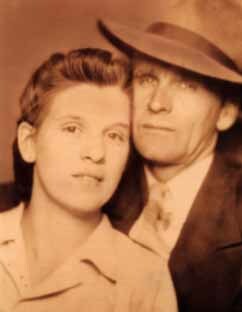 Thus on that date in 1941, William Branham and Meda Broy were married. He was 32 years old and she was twenty-two. Billy Paul was just six years old. At the time when Brother Branham married Meda, he had been saving money to take a hunting trip. But, now, a honeymoon became an extra expense that he just couldn't afford. Therefore, he combined the hunting trip and the honeymoon into one trip. He took his young wife and his son with him on a hunting trip. William Branham was given a fresh start, naturally and Spiritually. Sister Meda would see much in the form of the Supernatural in the Life and Ministry of the man whom God had sent to her. Over the next twenty-four years she would be a witness of the many mighty things which accompanied Brother Branham's Prophetic ministry - private and public. Based on information taken from the book "Footprints on the Sands of Time", published by Voice of God Recordings, which is a compilation of excerpts, by William Branham, taken from over one thousand tape recorded sermons.